It used to be so simple. There was one pay-what-you-want bundle: the Humble Indie Bundle. Inspired by World of Goo‘s one year anniversary pay-what-you-want sale, the Humble Indie Bundle featured DRM free versions of World of Goo, Gish, Penumbra: Overture (the predecessor to Amnesia), Aquaria, and Lugaru HD for whatever price buyers were willing to pay. It was a huge success, generating roughly $1.25 million towards charity, the developers, and the proliferation of further bundles. It was so successful that other organizations started following suit. Nowadays, it seems there’s a new bundle every week, stretching the limits of our sanity and our wallets. With so much activity going on in this new bundle space, it can be difficult to keep track. So much so that there are some out there who still think that the Humble Indie Bundle is the only bundle! Shameful! Thankfully, you are not that person, because you’ve got this edition of Gamer Survival Guide. Need a list of bundles? No problem. Are you missing bundles that you didn’t know were running? We got you. Are you buried under a sea of games and don’t know what to do about it? It’s cool! Read this handy guide and be infinitely more educated about the world of indie game bundles. Background: The Humble Indie Bundle is arguably the father of the modern bundle. To date, they’ve thirteen bundles including five numbered bundles with eight themed bundles in between. All games released via the HIB come 100% DRM free and with the exception of a handful of bonus games, run on Windows, Linux, and Mac OSX. 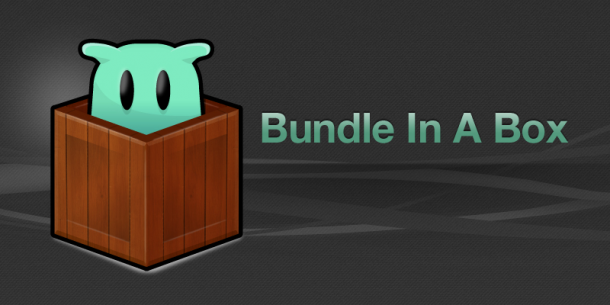 Some notable bundles include the Humble Indie Mojam, in which all three games were coded from scratch while the bundle was being sold, and the Humble Indie Bundle for Android 1 and 2, which featured games for Android as well as the usual platforms. Business model: The Humble Indie Bundle is entirely pay-what-you-want, though almost all bundles have included bonus games for paying more than the average price. Background: Most assuredly inspired by the Humble Indie Bundle’s success, Indie Royale is the combined brainchild of ModDB.com, IndieDB.com and Desura. Rather than offer the games as DRM free downloads, all of Indie Royales games are available for Desura, Steam, or both. Some previous bundles have included some pretty hefty games such as the May Hurray Bundle which featured 2011’s Dungeon Defenders. Business model: Indie Royale, while still technically pay-what-you-want, has a bit of a twist. The bundle usually starts with a minimum price of $3-$4. Everytime someone purchases the bundle at the minimum price, it raises by 1 cent. Wealthy well-wishers can keep costs low for everyone by meeting certain payment thresholds which lower the price by 1 cent for $10, 5 cents for $25, 25 cents for $50, and $1 for $200. Background: Indie Gala distinguishes itself by also including music and comics within bundles. Business model: Indie Gala is 100% pay-what-you-want. What separates it from other bundles is that games are organized into tiers. Paying under a certain amount gets you the most basic tier of included games, while paying above that amount adds additional games. Generally, bonuses are revealed at certain intervals after the bundle launches for those paying above a specified amount. Where does your money go? Indie Gala also gives buyers the opportunity to split their payment however they see fit between the developers, Indie Gala itself, and charity. At time of writing, the two currently supported charties were Able Gamers and the Italian Red Cross to support the victims of the May 2012 earthquakes in the Emilia-Romagna region of northern Italy. [/box_light] [box_light] Background: Groupees initially made a name for itself by offering music bundles, but has grown to include games, movies, and comics. It separates itself in the way that it handles bonuses. While Groupee bundles, much like other bundles, usually give a bonus for paying more than a goal amount, Groupees sets monetary goals for the bundle as a whole that are unlocked for everyone who paid more than the goal price. In this way, buyers who pay more than the goal price bring everyone else that much closer to unlocking bonus games and other content. Business model: Groupees has handled their game related bundles in a couple of different ways. So far, the company has hosted three separate Be Mine Indie Game Bundles which operate much like traditional bundles. They are pay-what-you-want with bonus content being offered for those paying above a certain threshold (usually $6). What sets it apart is the additional content that can be unlocked when the bundle itself raises a certain amount. In this way, buyers who pay more than the goal price bring everyone else that much closer to unlocking bonus games and other content. Groupees also broke the traditional bundle mold with their Build-A-Bundle, allowing buyers to pick any number of games from a predefined set to be part of their individual grab bag. With each game added, the minimum price was raised. Beyond that, it was still pay-what-you-want. Background: Born on Reddit, the GameDev is a new bundle, so new that it hasn’t launched yet. In order to keep the GameDev Bundle unique and to prevent people who have purchased other bundles from buying the same games again, Gamedev Bundle only accepts games that have not participated in any Humble Indie or Indie Royale bundles. Aside from that, their only other requirements are that games must run in Windows and be DRM-free. The semi-lax rules have led to a bundle that will be slightly more “indie” than most. Business model: The GameDev bundle will be 100% pay-what-you-want. Since the bundle is currently unreleased, it remains to be seen whether GDB will offer bonuses similar to other bundles. Background: Indie Face Kick is brought to you by the folks who brought you GamingAlltheTime.com. Currently, the bundle includes the unfinished game Tompi Jones and paying above the payment threshold of $15 gets your name in the credits when the game is released. The top contributor gets to name a boss or level in the game. Games are available on either Steam or Desura. Business model: IFK is pay-what-you-want. Currently, $1-$4 gets you Tompi Jones, Arkhelom 3D, and Alien Hallway, but paying $5 and up gets you access to Depth Hunter and Alien Shooter 2 as well. It’s a pretty standard bonus setup. Where does your money go? All proceeds for the Indie Face Kick bundle go right back into the developers! Background: From the Indie Underdog Pack site: “The Iup Bundle began as a crowd-funding effort supported by 8-Bit Funding. A group of indie developers joined forces to drum up support for their games and raise funding for their projects. We have stayed true to that idea, which is why IUP is for the underdogs!” And underdogs they are! The bundle features little known original classics like Tesla: The Weather Man, where you play as Nikola Tesla fighting an army of Thomas Edison’s killer DC powered robots, and Clone Wolf, a game where you clone your hero up to 32 times to fight off enemies. All games are available in the form of a Desura key and as DRM-free downloads. Business model: The Indie Underdog Pack follows the same standard pay-what-you-want + bonuses model as other similar bundles. It’s interesting to note that if you pay for just the basic bundle and decide later that you want the champion bundle, you have the option to increase your purchase amount in order to get those extra games. Where does your money go? Primarily back to the developers. However, 10% of the proceeds goes to support the ASPCA. This has the added upside of not requiring you to listen to Sarah McLachlan. Background: Bundle In A Box is brought to you by almost-freshman game developer Kyttaro Games. Business model: Bundle In A Box uses a weird Frankenstein version of a few different business models. It’s pay-what-you-want with a minimum price, but paying above the average unlocks bonus content. Further bonus content is unlocked once a certain number of bundles are sold. Additionally, at certain sales thresholds, the minimum price lowers. That’s a lot of information to take in, especially considering that the above list is comprised of only the major bundles; there are new ones popping up all over the internet every day! The fact that they’re usually too good to pass up poses a problem: how do you tell when bundles are released? Since there are so many, you’re not going to check all the sites every day on the off chance that a new bundle is released, unless you’re obsessed with bundles or a masochist. Thankfully, there are people on the internet who are just that and are devoting themselves to making it easier for you to snag all the indie games you can eat! Bundle Tracker is currently nothing more than a twitter account, but it’s one of the most efficient ways to keep track of currently running bundles. Following @BundleTracker will give you a heads up when new bundles are released and will also give you access to an almost constant stream of bundle giveaways. There’s another problem, however, and it’s a big one. After you’ve purchased all these bundles, you’re going to be drowning in a sea of Steam keys, Desura keys, beta codes, and direct download links to your purchases. It’s easy to make an impulse decision to purchase a bundle, but it’s a lot more difficult to keep track of your purchase after you do. If you don’t stay on top of it, expect to lose a lot of your content. There are a few ways you can make sure that doesn’t happen. Most if not all bundles use the preferred delivery method of email to get you links to your bundle content. Your first line of defense should be to save these emails. If you’re really meticulous, you can set up filters for each of the bundles to catch all future purchases. However, probably just a filter for the word bundle will suffice, although you may have to deal with the occasional misplaced announcement about a coworker’s new bundle of joy. I know it sounds a little obsessive and you’ll probably redeem most of your content on Steam or Desura, but most bundles give you DRM-free versions of their included games and for certain titles, that’s your only option. The emails you receive usually contain a link to a redemption page with links to the individual games. Have you considered a spreadsheet containing the names of the games you own as well as links to the DRM-free versions of those games? Also, if you’re buying all these bundles, you’re going to end up with codes for games you already own. Throw those on the sheet too! You never know when an extra copy of a certain game might come in handy. These bundles are a pretty new concept. Because of that, it’s nearly impossible to predict how long they’ll be around. I would like to say that this streak of goodwill towards independent developers and charitable generosity will continue on forever, but anything could happen. If and when some of these bundles go dark, don’t expect your download pages to remain. While you will still have access to anything you redeemed through Steam or Desura, your DRM-free purchases will be lost. Unless you saved them. Yes, good old fashioned hard copies and backups is the most sure fire way to hang on to all those games. Keep em in a folder on your hard drive, put em on a disk, store them in the cloud, because when the apocalypse comes and the world goes dark, you’re still going to want to be able to fire up your backup generator and play some vidya games during the last few precious hours of your life, before you are most assuredly swallowed by the Dark Ones. Bundles can be a tricky thing to deal with but are usually such a steal that they’re impossible to pass up. More than that, they’re a way for us to support indie developers, donate to charity, and get a bunch of really cheap games all in one transaction. That’s not an easy thing to do. As they grow in popularity, it’s only going to become harder to catch all those sweet deals. But now you’ve got a secret weapon. Good luck. See a bundle I missed or know of a good resource for keeping track of new bundles? Email mikebachmann@sidequesting.com and I’ll add it to the list! Also, want a chance to win one of many bundles donated by our friends at Indie Gala, Indie Royale, and Bundle Tracker? You can find those details here! Mike is a professional amateur, dabbling in many things. One of those is writing of course, but also co-hosting and producing "Fistful of Pixels", an improv comedy show about theoretical video games.